Construction on downtown’s long-delayed River Center Branch Library is expected to finish by Oct. 30. Casey “Bubba” Cashio, building and grounds director for the city-parish, said at this morning’s Downtown Development District Board of Commissioners meeting that repairs are currently underway and the anticipated October construction completion date includes remediation efforts. 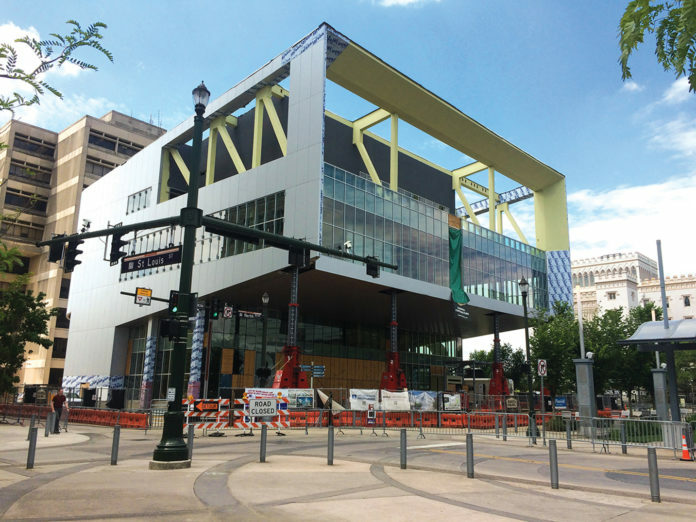 Not known is when the library will open to the public, with Casio saying the East Baton Rouge Parish Library System will handle moving the library’s collection in the building. Library system officials were not immediately available for comment. Construction resumed on the 50,000-square-foot library last month after the project was stalled for nearly a year as a result of a structural failure, which threatened the integrity of the building’s cantilever overlooking North Boulevard Town Square. Before problems arose, the project was scheduled to be finished last fall.